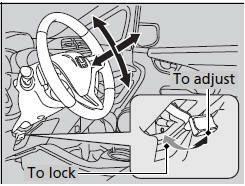 ► The steering wheel adjustment lever is under the steering column. ► Make sure you can see the instrument panel gauges and indicators. ► After adjusting the position, make sure you have securely locked the steering wheel in place by trying to move it up, down, in, and out.